Fall harvest is winding down which means I have more time in my home kitchen, yay! It also means it is time to reference my beloved collection of slow cook recipes. I have been in “quick and easy” cooking mode for the past two months and my whole family is looking forward my transition to more involved recipes and the smell of dinner wafting through the house. 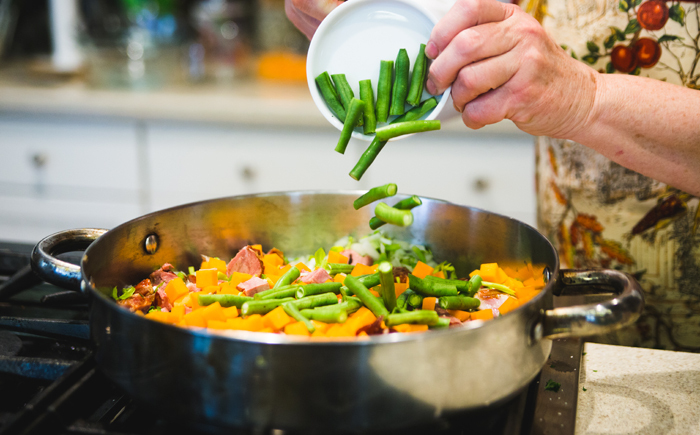 Due to a chill in the air, I found myself craving a hearty fall soup this week and this recipe for Butternut Squash and Bean Minestrone fits the bill. As I eluded, this recipe is a little more involved than most of mine. It requires a good piece of an afternoon to slow cook the beans and infuse the soup flavors. In fact, I usually start this one around 2pm in the afternoon and enjoy reading a book in between steps until dinner. 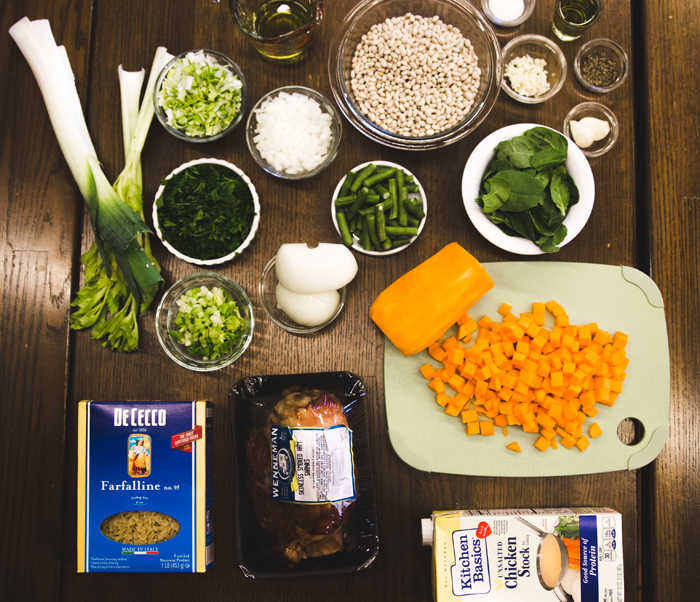 This recipe calls for ham hocks which are available from Eckert’s butcher. The ham hock bones and meat add much smoky goodness to this soup. However, If you don’t have a local butcher, you can substitute about a pound of chopped bacon. Tip: If you are unsure how to remove the meat from the ham hocks, do a google search in YouTube and you will find some helpful videos. This recipe makes a rather large batch so you can freeze it or pack it in lunch size containers for the week like me. If you find yourself with a free afternoon and a craving for comfort food, give this recipe a try! Removed meat from ham hocks and cut into large pieces; set meat aside. Place navy beans and ham bones in a large (5-quart) stock pot; add cold water to cover beans by 2 inches. (Not all of the ham bones will be covered.) Bring to a boil, reduce heat, and simmer 2 minutes. Remove from heat, cover, and let stand 1 hour. Heat ¼ cup olive oil in a 12-inch skillet over medium-low heat; add hock meat, onions, leeks, celery, and garlic. Sauté stirring occasionally until vegetables are softened, about 10 to 12 minutes. Add meat and vegetable mixture to the navy beans, the soaking liquid and bones. Add chicken broth. Bring to a boil and immediately reduce heat to low, cover and gently simmer until navy beans are firm about 1½ hours. Add the butternut squash and green beans and continue to simmer about 30 to 40 minutes or until the beans and vegetables are firm but tender. 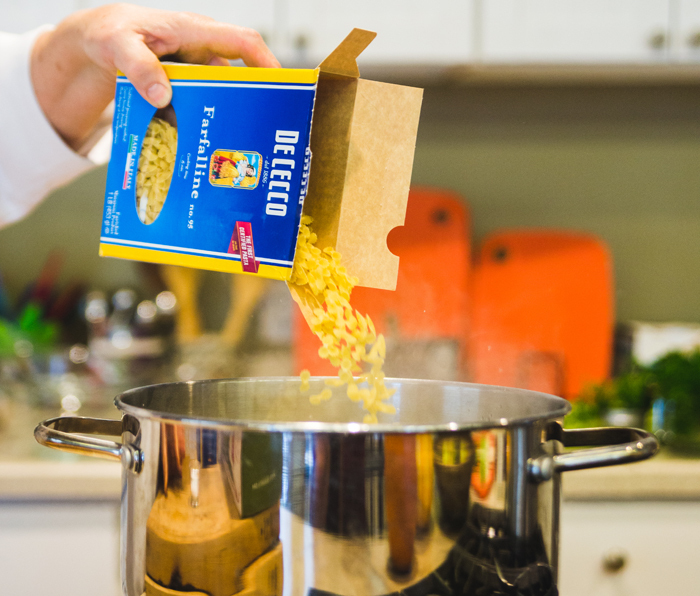 During the last 10 minutes cooking the soup, take a 4-quart pot, cook pasta in boiling, salted water, stirring occasionally, until pasta is al dente about 5 to 8 minutes. Drain and transfer to a large bowl. Drizzle with 2 tablespoons olive oil and add ¼ cup parsley and toss to coat. Set aside. Meanwhile, discard ham bones. Add fresh spinach and remaining ¾ cup parsley to soup. Stir. Divide soup among bowls. Add about ½ cup cooked pasta per bowl, drizzle each bowl with small amount of olive oil. Note - Soup can be made up to 3 days ahead and refrigerated. Place hot soup in a shallow container in refrigerator; stir occasionally until cold. When cold cover; warm before serving.